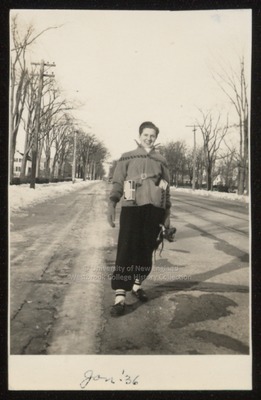 Shirley Cunningham, Westbrook Junior College student, walks down Stevens Avenue in this 1936 black & white candid snapshot with "Jan '36" written in blue ink on the front. On the back is written in blue ink "Shirley Cole." Shirley is dressed in a winter jacket and ski pants and mittens; she wears socks and loafers on her feet and carries a pair of skates in her left hand. Strapped at her waist on her right side is a box; papers protrude from her left jacket pocket. She walks along the edge of Stevens Avenue towards Evergreen Cemetery, possibly to the duck pond for ice skating. Trolley tracks are visible on the Avenue. Campus houses facing Stevens Avenue on the even numbered side are visible over Shirley's right shoulder.